Gasunie is a leading European gas infrastructure company. We serve the public interest, offer integrated transport and infrastructure services to our customers, and adhere to the highest safety and business standards. We focus on short- and long-term value creation for our shareholder(s), other stakeholders and the environment. We believe in a sustainable future with a balanced energy mix and a lasting role for diversified gas. We believe that we serve our customers best with innovative gas infrastructure solutions. Our task is to ensure safe, reliable and affordable gas transport, which is of crucial importance to society. Through our infrastructure, services and geographical position, we are at the heart of the European gas market. Our infrastructure connects end users and suppliers of energy. It functions as an international hub for the supply and throughput of gas. For this purpose, we manage and develop gas infrastructure and gas trading points: gas transport networks, international transit pipelines, gas storage, LNG infrastructure and virtual gas trading points. This enables us to contribute to a liquid, competitive and reliable European energy market. Through our network in the Netherlands and Germany, we transport nearly a quarter of the total gas consumption in the European Union. We occupy an independent position in relation to production companies and/or suppliers, and apply an open-access model. This means that our infrastructure is available to all our customers on equal conditions. Our services in this regard are transparent and non-discriminatory. The customers that make use of these services are gas producers, energy suppliers, traders and end users such as power stations and large industries. We contribute to the transition to a sustainable energy supply in which gas, of various kinds, ensures a stable and affordable energy system. To this end, together with partners, we develop sustainable technologies and infrastructure. For instance, we are investing in projects for the feed-in of green gas into our network, as well as in infrastructure for the use of LNG for water and road transport. We are a state-owned company and the Dutch State is our only shareholder. Our employees are spread over more than 30 locations in the Netherlands and northern Germany. Our headquarters are in Groningen (the Netherlands), and our main office in Germany is located in Hannover. By making use of suppliers, contractors and subcontractors in the Netherlands and Germany, we make an important contribution to local employment opportunities. Our internal value creation chain consists of activities and processes for our transport and infrastructure services. In this chain, we act as an employer, partner, neighbour, customer, knowledge institution and a party contributing to the revenues of the Dutch State. 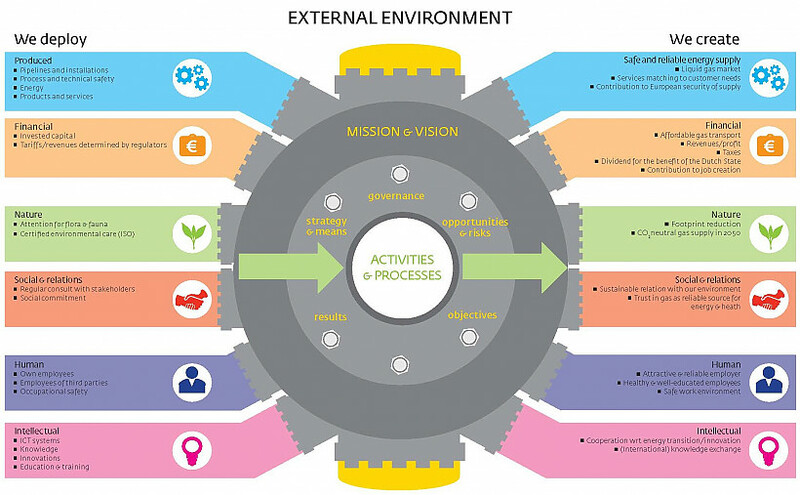 Our value creation model shows the input (financial, produced, intellectual, human, social & relationships, and nature) that we use to achieve our strategic objectives, and the value we add through our core activities. * This model is based on the IIRC guidelines for integrated reporting. We have two subsidiaries that own and manage a gas transport network: Gasunie Transport Services (GTS) in the Netherlands and Gasunie Deutschland in Germany. These subsidiaries are managed as business units of the holding company. Our third business unit, Participations & Business Development, develops and manages our other infrastructure services. These include gas storage, transport through international pipelines (including sea pipelines), a terminal for the import of liquefied natural gas (LNG), and our share in the gas exchange ICE Endex. These activities support the liquidity and functioning of the gas market in the areas in which we are active. In this way, they contribute to the useful deployment of the networks of GTS and Gasunie Deutschland. In providing these activities, we compete with other providers. Our business units are supported by various service providers, such as those in the areas of IT, finance and HR. In addition, when commissioned by the business units, the Operations and Projects departments carry out the management, maintenance, adjustment and expansion of the infrastructure. We participate, usually in cooperation with other parties, in a number of companies that contribute to the security of supply in the field of gas in Europe. The most important of these are mentioned below. The Gate (Gas Access To Europe) terminal is located on the Maasvlakte in Rotterdam and is as yet the only import terminal for liquefied natural gas (LNG) in the Netherlands. The increasing need for natural gas, combined with declining European production, means that additional gas will need to be imported. Through Gate, the Dutch gas transport grid is connected to the global supplies of natural gas, thus contributing to the diversification of the gas offer in Europe. At the terminal, LNG is stored, regasified and pressurised for distribution to the Dutch gas transport network. Gate allows quick access to the large nearby natural gas markets in north-west Europe. In addition, Gate is developing into a hub for LNG imports and exports, with a versatile offering of small-scale LNG services. 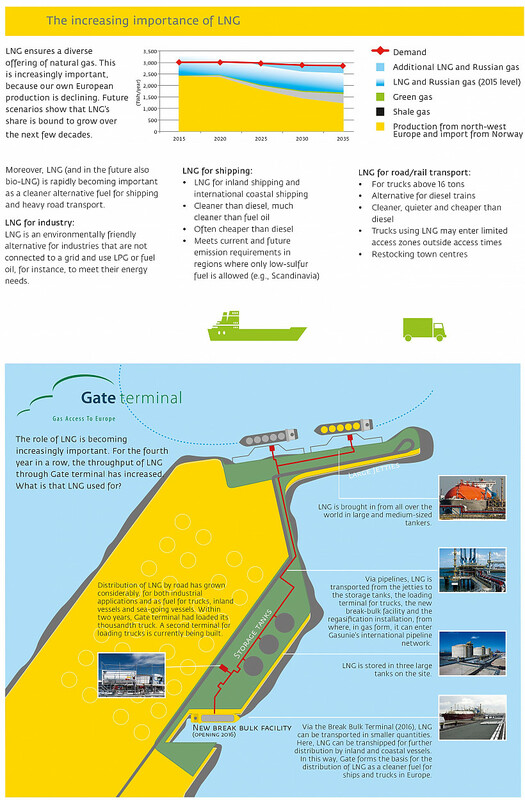 This enables Gate customers to distribute LNG as a cleaner fuel for sea-going vessels, ferries, trucks, and for industrial applications. We have a 50% interest in Gate terminal C.V. 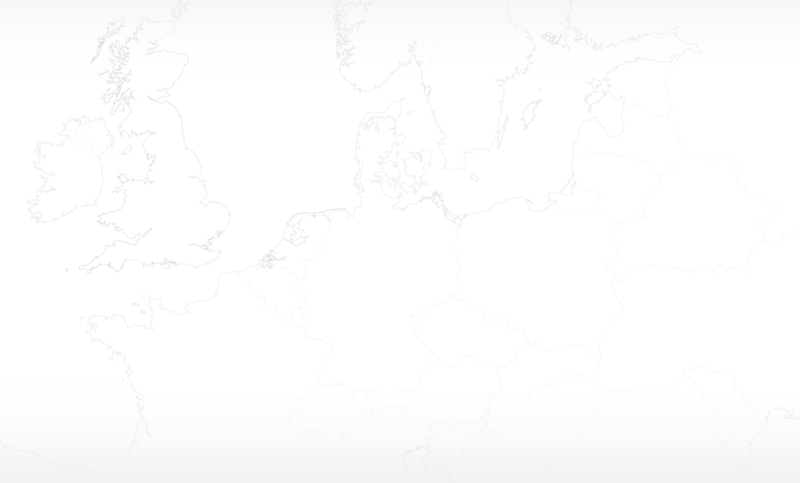 The Nordeuropäische Erdgas Leitung (NEL) is the connecting pipeline between Nord Stream and our German network. It allows gas from Russia to flow directly into our network. 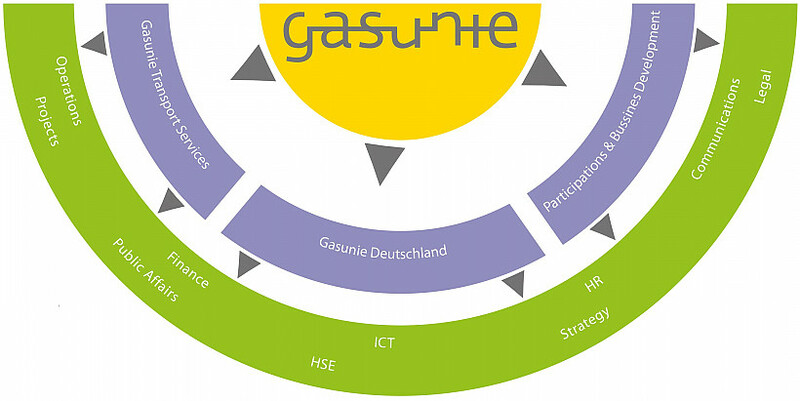 The management and operation of NEL forms an integral part of the network management activities of Gasunie Deutschland. We have a 25.13% interest in NEL. This facility for underground gas storage compensates for short-term fluctuations in the supply and demand of natural gas. The very high flexibility of this buffer (quick storage and dispatch) is important for balancing the portfolios of the EnergyStock customers and the GTS network. In addition, the gas storage is used by traders who take advantage of price fluctuations in the energy market. We have a 100% interest in EnergyStock B.V. The Peakshaver installation on the Maasvlakte in Rotterdam liquefies natural gas (LNG) and stores it in tanks. The natural gas can be used on days with heavy frost, when small-scale consumers (domestic households) need extra natural gas. At peak times, LNG is liquefied and then delivered to the gas transport network of Gasunie Transport Services (GTS). We have a 100% interest in Gasunie Peakshaver B.V.
Subsidiary Vertogas works by order of the Ministry of Economic Affairs as a certification authority for green gas. It issues certificates that confirm the sustainable origin of green gas and prove the sustainability of the production method in a transparent way. We have a 100% interest in Vertogas. ICE Endex is a leading exchange in continental Europe for spot gas and derivatives markets. 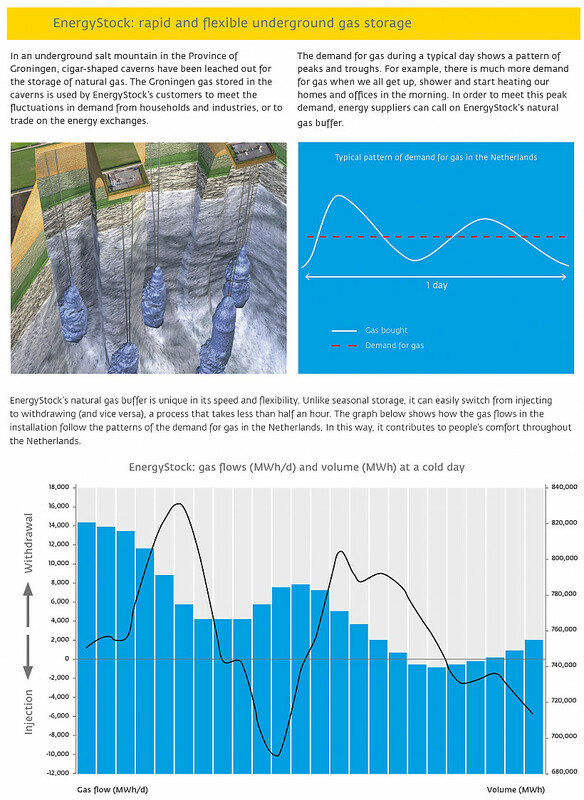 ICE Endex facilitates the trade in natural gas, but also the trade in electricity, biomass and gas storage futures. Amongst other things, it facilitates the trade flows of the Dutch TTF, the largest gas trading point in Europe. We have a 20.88% interest in ICE Endex. Our revenues are entirely generated from activities relating to our gas infrastructure. The activities of the business units GTS and Gasunie Deutschland are largely regulated, in contrast to those of Participations & Business Development (P&BD), which are not or only partially regulated. The core service provided by GTS and Gasunie Deutschland is the provision of gas transport services in a customer-focused and transparent manner. They do this by selling available capacity in a reliable network on competitive terms. The gas can be fed into the network at entry points, and customers can retrieve gas from the network at exit points. Customers enter into contracts with which capacity is booked at certain entry or exit points in the network for a certain period (year, quarter, month or day). Our network competes with networks in other countries with regard to transport of international gas flows. GTS and Gasunie Deutschland are responsible for the management and maintenance of their operating assets. The tariffs that GTS and Gasunie Deutschland charge their customers are regulated. They are determined once a year by the regulator, which reviews the method of regulation every 3 to 5 years. The regulator in the Netherlands is Autoriteit Consument & Market (ACM), and in Germany it is Bundesnetzagentur (BNetzA). At the moment, a system of revenue regulation applies to GTS and Gasunie Deutschland: the tariffs are calculated by dividing the permitted revenues for the year in question by the estimated capacity bookings. If the actual number of bookings is different, and thus the revenues generated, the difference will be settled in later years. Differences between expected and actual energy costs relating to gas transport are also taken into account in the tariffs on an annual basis. The revenues permitted by the regulator consist of a capital cost allowance for the invested capital, a reimbursement for the annual depreciation costs (calculated on the basis of the depreciation periods determined by the regulator) and a reimbursement for the operating costs. In addition, the regulator may impose an efficiency discount and reduce the tariffs accordingly. The participations are responsible for the sale and delivery of gas infrastructure services and for the management and maintenance of their assets. Their customers buy capacity, which entitles them to use the relevant infrastructure during a certain period. The tariffs for these services are mainly determined by the market of supply and demand. These participations support the proper functioning of the energy market, and position the Netherlands as a hub in the international gas flows. Another important focal point for the Participations & Business Development business unit is the facilitation, stimulation and development of the transition to a sustainable energy system. Our focus here is on facilitating clean applications of natural gas, increasing the feed-in of various kinds of sustainable gas, and good interaction between gas and other energy carriers, such as heat and electricity. We particularly focus on the innovative application of our infrastructure (e.g., in the field of renewable gas and storage of sustainable energy), as well as new product/market combinations for natural gas, such as the deployment of LNG in the maritime and road transport sector. These new activities should fit in with our strategy, be commercially sound and, if applicable, contribute to the useful deployment of the existing gas infrastructure. These activities are developed in the Participations & Business Development business unit. The business risks and return targets of this business unit’s activities are higher than those of our fully regulated activities. This is because most participations compete in the free market. Both within the regulated and the non-regulated domains, the decision to invest in new infrastructure is always preceded by a thorough analysis of the market developments, the wishes of our potential customers, and commercial and technological feasibility. We see a trend that long-term contracts are increasingly being replaced by short-term contracts, which increases the business risk. In addition, the market for sustainable energy is still in a phase that requires not only a vision, but also innovation. Besides opportunities, this leads to insecurities and risks, because investments in new technologies often yield returns only in the longer term. All this places higher demands on strategic partnerships, risk analyses and the way in which risks can be mitigated. When we invest in facilitating strategically important new developments, we are prepared to use adjusted revenue models and consider a higher risk profile in our decision-making. In our view, the development of new revenue models and efficient participation structures for gas infrastructure companies is inextricably linked with succeeding in our ambition to play a leading role in the transition to a sustainable energy system. We maintain relationships with many different stakeholders, such as our shareholder, our customers, our partners in participations, our employees, the Works Council, the local community, decision-makers, authorities, regulatory bodies, investors, suppliers, the media and social advocacy organisations. Our activities affect them, and their activities affect us. We attach great importance to knowing the interests of our stakeholders and taking them into account in our decision-making. In our stakeholder table in the annex, we provide more details about our most important stakeholders and their interests, as well as the dilemmas we face. We exchange most information through personal contact with our stakeholders. This personal approach is taken at all levels within the company, and by all departments. Our Executive Committee is also closely involved in this process, and has frequent contact with different stakeholders during the year, varying from the shareholder and political representatives to advocacy organisations and customers. In addition, we communicate through channels such as our website, social media, advertisements and newsletters. When reporting on our results in our annual report, we believe it is important to take our stakeholders’ opinions into account. That is why, in 2015 (just as in 2014), we carried out a materiality analysis (see Materiality), asking stakeholders from various groups what they think of their relationship with Gasunie. Their opinions can be read in various places throughout this annual report. Over 15,500 kilometres of our pipelines lie under the ground in the Netherlands and Germany, in one of the most densely populated areas in the world. This means that we have many ‘neighbours’, and we want to treat them all with respect. In our work environment, we often have to engage with (local) politicians, as well as with local residents and nature organisations, to name just a few. Whenever our activities are likely to affect them, we involve them in our plans at an early stage, sharing as much information as possible. For example, we organise information meetings, discussion evenings and Open Days. We use the feedback we receive during such sessions to minimise inconvenience and maximise added value while performing our activities. We are increasingly making use of a well-known method for stakeholder management: Strategic Environs Management (SEM). This approach enables us to organise contacts with surrounding communities in such a way that we can identify potential conflicts of interest at an early stage, after which they can be resolved in mutual consultation. In 2016, we will embed SEM in our organisation more systemically and train the employees involved. Laws, regulations, policies and other government decisions have a big impact on our activities. At the same time, we form an important discussion partner for the government with regard to national and international energy policy. We want to be a serious, constructive partner for governmental authorities at all levels. Our activities mean that we frequently need to consult with local and other authorities (e.g., on legislation, regulations and licences). We are often also involved in consultations with national and international political stakeholders, in particular through our offices in The Hague, Hanover and Brussels. Through our local presence, we are able to build and maintain good relationships with the various governmental stakeholders. When I think of Gasunie, I think of reliability – in two senses. Gasunie does everything neatly, and without a fuss. But it could be a bit flashier. When the gas roundabout was being developed, there were some clear ambitions. Then, after a period of expansion, it took a blow when there was a lot of to-do around gas. Now, among all the developments going on in the world today, Gasunie needs to show what the Netherlands has to offer. Gasunie still needs to be a pillar of strength. But it could do so with a bit more ambition. For GTS’s customers, we organise ‘shipper meetings’ during the year. These serve as information meetings and networking platforms. At these meetings, we discuss developments in the gas market, as well as GTS’s products and services. In addition, customers can request an individual consultation to ask specific questions. In 2015, we organised shipper meetings in May and November, which were attended by approximately 90 customers. GTS’s customers clearly appreciated these meetings, giving them a rating of at least 7.4, just as in 2014. We value the feedback we receive from our stakeholders. It helps us to align our services with their needs even better. We collect feedback at all our touch points. In addition, GTS conducts an annual customer satisfaction survey. For more information about this survey, see Results. To determine which topics our stakeholders and our own organisation would find most relevant to see reported on in our annual report, we carried out a materiality analysis. On the basis of various policy documents and the annual reports of a number of similar companies, we drew up a shortlist of possible topics. We then asked our stakeholders by means of a questionnaire to indicate the relevance of these topics for our annual report. In addition, in an internal discussion, we considered the potential impact of these topics for our company. In this annual report, we mainly report on those topics that emerged from the materiality analysis as being most important to our stakeholders and our own organisation. In the table below, we show the fifteen most important topics and an explanation of what they mean to us, as well as a reference to where they are discussed in the report. A complete overview, including all material themes, explanations of the terms used, and the way in which the materiality analysis was set up, is given in the annexes. In the section ‘Linking value creation and strategy’ later in this report, the material topics are linked to our strategic pillars, the values from our value creation model, our result areas, and KPIs. What does this topic mean to us? Uninterrupted supply of gas through our network is our priority. We have therefore set a collective target for security of supply. Good performance in the field of external safety safeguards our licence to operate. We closely follow laws and regulations, and measure our performance on the basis of, for instance, the number of incidents involving pipeline damage. One of the ways in which we monitor this aspect of safety is by keeping track of the number of incidents involving excavation damage. We aim to create a healthy work environment, both in the field and in the office. This includes creating awareness around safe working and creating an ergonomic work environment. We also measure the work pressure experienced by our employees. To measure our performance appropriately, we monitor (among other things) absenteeism figures and the Reportable Frequency Index. We are clear about our targets and how we aim to reach them. We are transparent in our contacts with stakeholders. In our annual report, we elaborate on our activities, explaining not only what went well, but also what did not go so well and what we are doing to improve matters. We want to contribute to a sustainable energy supply (e.g., in the field of green gas). For this purpose, we enable initiatives and seek cooperation with partners. In all phases in the life of our infrastructure, we pay attention to process safety: during design, construction, management and maintenance, and operation. This crucially includes inspections. When carrying out our activities, we comply with laws and regulations. We have a vision when it comes to national and European energy policy. We share this with policy- and opinion-makers, as part of our Public Affairs activities. We have a solid business model that enables us to contribute to the Dutch economy. To be able to contribute to a sustainable energy supply in the long term, too, we are examining the possibilities of new revenue models. Every year, we pay out part of our profit to the Dutch state. The way we manage our company is determined in part by financial performance indicators, which are included our corporate targets. We limit our emissions into the environment as much as possible. We therefore monitor our emissions of various kinds, such as CO2 and NOx. We use a collective target with regard to CO2 reduction. Information security is essential if we are to perform our activities safely, such as managing the gas transport network and capacity booking by customers. The energy supply transcends boundaries. We want to play a leading role in this and contribute to a reliable energy supply and a liquid gas market. To achieve that, we work together with European partners. As the opinions of our customers are very important to us, we measure customer satisfaction through a survey. On the basis of the results of this survey, we set up improvement actions. We are part of the community around us, and want to show our engagement. We do this in various ways, including by making available an annual budget for sponsoring and donations. *) In 2015 and 2014, there were no effects that required normalisation.